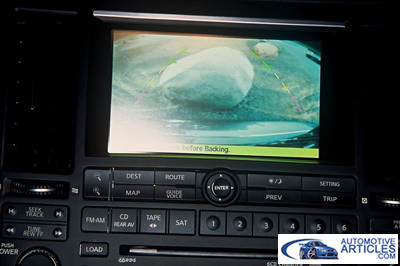 Trunk-Mounted Q45 Rearview Camera. Courtesy: Nissan NA. When you get into your car every day, what is one of the worst fears that goes through your mind? If you�re like me, and live in a busy family-populated neighborhood, you�re probably worried about running over one of the neighbor�s rugrats � or one of your own. I know every time I back out of the garage, I�m watching like a hawk for one of the nearly-dozen or so fire hydrant-high grade-schoolers that constantly run (or ride, or scream, or walk�slowly) down my otherwise quiet cul-de-sac and whom never seem to understand that a moving vehicle means they should do the same � move. While there may be times where I want to purposefully mow down a couple of the brat-pack leaders, I don�t even want to imagine accidentally backing over and killing one of them. If I had children of my own, I�d probably need therapy just thinking about it. As such, I try to be extremely careful � but accidents can happen. However, if I ever did introduce one of the neighborhood toddlers to the underside of my Maxima, I�d probably have to schedule my mouth a visit with the business end of a shotgun. Now here�s where the story gets interesting. Over a month after the event, the family is now suing Nissan Motor Company � the parent company of Infiniti � because their vehicle was not equipped with Nissan/Infiniti�s optional rearview camera. 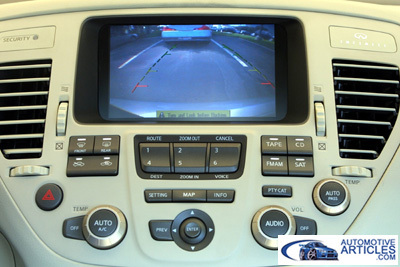 The camera, available on such high-end models like the Infiniti M45, Q45, FX35/45, and QX56, allows live video taken by a camera mounted in the trunk/tailgate to be displayed on the vehicle�s LCD navigation-system screen on the dash when the vehicle is in reverse. The camera debuted on the 2002 Q45 and trickled down to other Infiniti models � and is now being offered by other automakers, including Lexus. 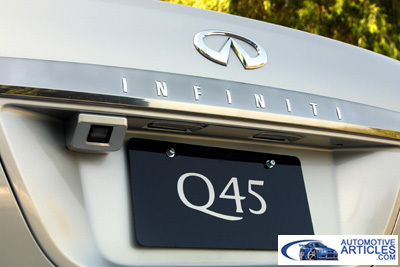 Q45 Rearview Camera. Courtesy: Nissan NA. The family says the death of the young girl was their fault and that the lawsuit is not just against Nissan, but is meant to influence the entire automotive industry. Nissan, for its part, called the death sad and tragic, but contends their rearview camera is a creature comfort and not a replacement for common sense. "It's a convenience; it's not a substitute for proper reversing procedures,� a spokesperson said. "Drivers should always turn around and look." In fact, Nissan�s original television ads touting the 2002 Infiniti Q45�s rearview camera featured a man driving through a spiral parking structure in reverse � espousing the convenience of such a luxury. Interesting, it was Lexus that ran an RX330 commercial that showed a man narrowly avoiding running over his young daughter because of the vehicle�s backup camera. The warning, �Turn and look before backing� is clearly visible in this undated Nissan press photo. That�s all beside the point. The question remains, is Nissan legally (or morally) responsible for the death of a young child because the owner of one of their vehicles ran her over? Were they negligent in offering the rearview camera in some vehicles as an at-cost option rather than making it a standard feature on all of their vehicles for the good of society? In my opinion, I just cannot see how Nissan could be legally responsible. Were they the ones who forced this man into purchasing their vehicle? Did they demand he get into his vehicle without checking behind it that fateful day? Did they force him to slide the gear lever to �R� and let his foot off the break without being entirely sure his daughter was not behind his luxury SUV? The answer is no, the responsibility of this child�s death lies solely on her father, sadly. God hasn�t been successfully sued in court, has he? I also doubt Nissan was negligent in their business decision to make these cameras optional equipment on higher-end vehicles. If the claim is that Nissan is at fault simply because they don�t want to pay for the cost of making the camera standard, then the family is equally at fault because they did not want to pay extra for it � they knew they had a small child, after all. The camera, from Nissan�s perspective, is a toy more than a safety feature. It�s a ploy to advance Infiniti�s slogan of �Accelerating the Future,� not a replacement for ones� obligation to make sure the path of his vehicle is free of young children. The automotive industry, and others, often uses high-end products to introduce new features/technology. Airbags, antilock brakes, stability control, navigation systems, air conditioned seats � things like these started their lives in expensive cars. Why? Because, at the time, they were untried and expensive new ideas. The cost of these new technologies is easily diluted when the vehicle stickers at $50,000 or more. Not to mention that car companies get to evaluate the real-world performance of these new experiments in a limited number of vehicles to make sure they work as designed before releasing them to the masses. If automakers were forced to equip all vehicles with every new, untried, and expensive technology without the proper evaluation � the cost would likely stifle new development entirely. Not only would it be enormously expensive to automakers and consumers, but the potential for life-threatening defects could also increase. The rearview camera is not even a true safety feature, yet this family wants it on all vehicles. Tell that to the family who wants to replace their 1980s Ford Fallingapart with a newly designed Kia that meets modern safety standards � but wouldn�t be able to afford it because some guy who neglectfully ran over his kid made it so that all cars had to have expensive camcorders screwed to the back of their trunks. FX45 Rearview Camera. Courtesy: Nissan NA. To me, this looks like a case of a family simply attempting to place the blame and the guilt of the death of their daughter on a company that had no responsibility in the cause of her death whatsoever. Perhaps worse, it could be a case of a family attempting to profit off of the death of their own daughter. I hope not, but if that�s the case, they�ve already received the punishment that will last a lifetime. If this is an attempt to improve society via litigation, they really need to look harder at their actions. Not everyone can afford to pay for the latest and greatest in not-so-safe safety equipment. This family even chose to bypass the camera option when they paid well over $30,000 for their luxury SUV. For Nissan, this presents a painful dilemma. Do they fight the lawsuit to protect their credibility and risk looking like an insensitive corporation spitting in the face of a customer who just lost his daughter? Or do they just pony up the cash (which would likely be less than paying to fight in court, and would probably go to the family�s lawyer anyways) and risk looking like they admit fault in the death of a toddler? This isn�t the first time the company has been faced with a litigation problem. Recently, the state attorney general of New Jersey filed suit against Nissan because, apparently, the company makes headlights that are too attractive to thieves. Rather than go after the criminals they allow to live free on their streets, the government of New Jersey is going after a multi-billion dollar company for making appealing products. What�s next, suing Mercedes because their entire vehicles are enticing to thieves? In the end, this case in Texas will likely either be settled out of court, or thrown out of court. I hope it�s the latter, and that Nissan will fight this battle. We cannot go on blaming everyone but ourselves for the problems we cause. The sooner this family takes responsibility for its role in the death of their daughter, the sooner they can heal and move on from this tragic event. Even if they win, suing Nissan will not bring back their daughter � only victimize a company that did nothing to cause her death. 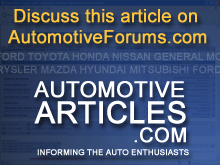 Editor�s Note: The opinions contained within this article are those of the author and do not necessarily reflect those of Automotive Network, Inc. or any of its affiliates or employees. To discuss this article further in AutomotiveForums.com, click the link below. Want Your Car to be the Next AA Car of the Week?